In this edition of homify 360, we visit a modern home with minimalist features, elegance and simple materials that add style and unique charm to the interior. The house is a sophisticated sight from the street, and enjoys a great deal of natural light and fresh air, but what we love the most is that when you step inside, you'll find a cosy but spacious home. The interior features an open plan living space filled with neutral, friendly tones of wood and whit walls, making it a contemporary and chic space, we wish we could move in right away. For now, however, let's simply take a look. 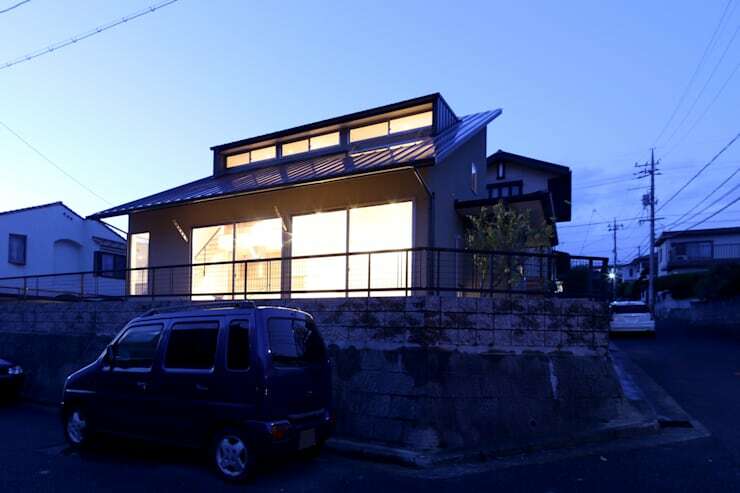 The brilliant illumination of this exterior is attractive, warm and welcoming. The structure may have an odd architecture, but that's what makes this home an inviting feature on the street. It's different and dynamic, making this modern home a minimalist loving living space, that we cannot wait to begin exploring. The architects of this home ensured that it has an exciting design. This interior of the home, including the dining area, is filled with light and neutral colours, creating a tidy and uncluttered appearance that is stylish and elegant. The kitchen is part of the open plan layout, allowing for entertaining and socialising to be a regular feature in this home. The wooden dining table is simple, chic and wonderfully inspired by the Scandinavian style. 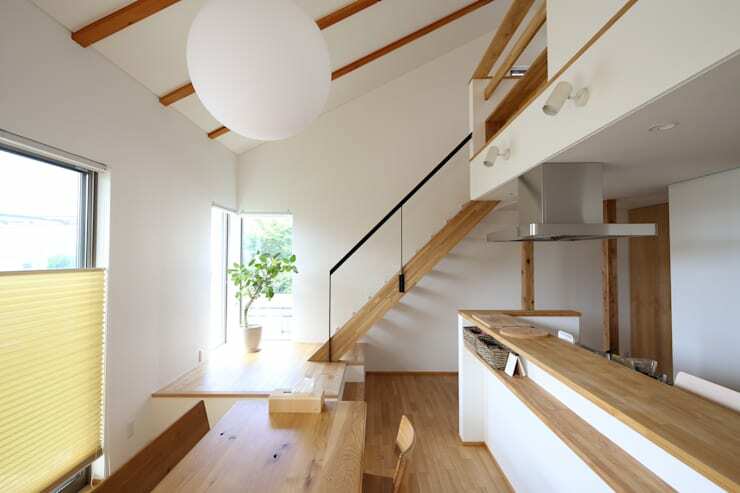 The area has a sloped ceiling, adding a cosy ambiance to this interior. The kitchen is another neutral colour aspect of this home. The space has a minimalist appeal, with very little extra detail. The openness of this kitchen makes it a relaxing place to prepare and serve meals, and with the uncluttered design and layout, it's easy to keep neat and tidy. 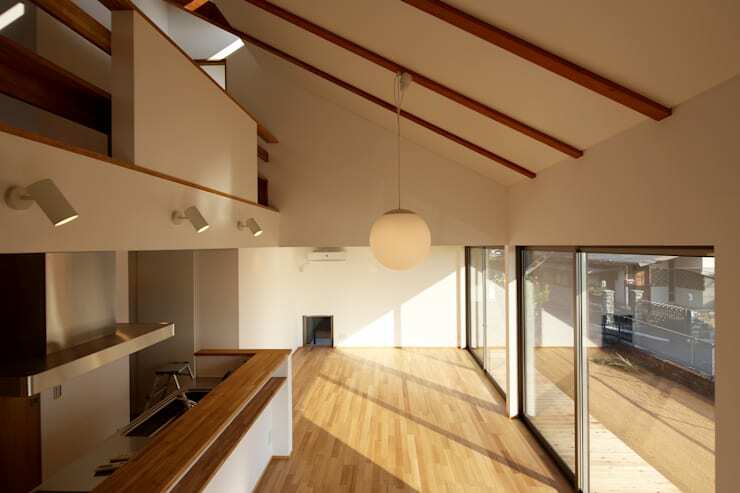 The natural sunshine entering the home is another great element of the design, perhaps the central theme, as brings a cosy warmth to the house, ultimately making it a home. 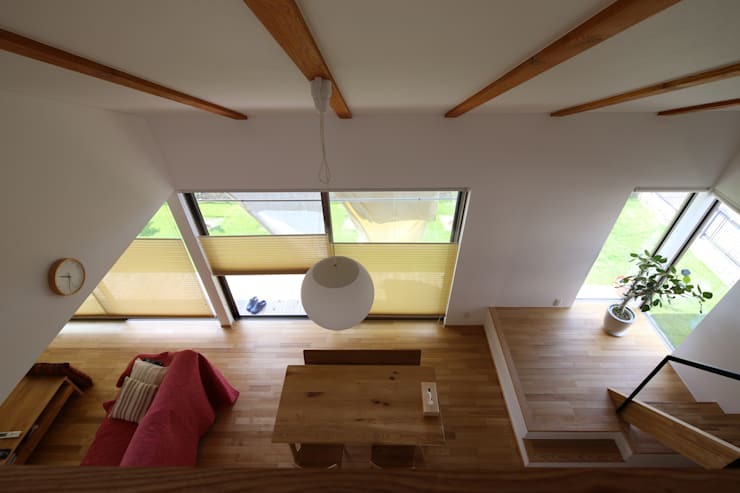 This top view gives us another perspective on the minimalist home. Here we can see the spacious layout, lovely natural light and simple, uncluttered appearance of the open plan living arrangement. The space has comfortable lighting located throughout the interior, while the neutrally coloured wooden furniture, flooring and fixtures add a chic design feeling that make the whole thing feel simple but stunning. A minimalist wooden staircase is the perfect addition to reach the top floor of this contemporary home—every two floor home needs a staircase, and one like this is the perfect choice. 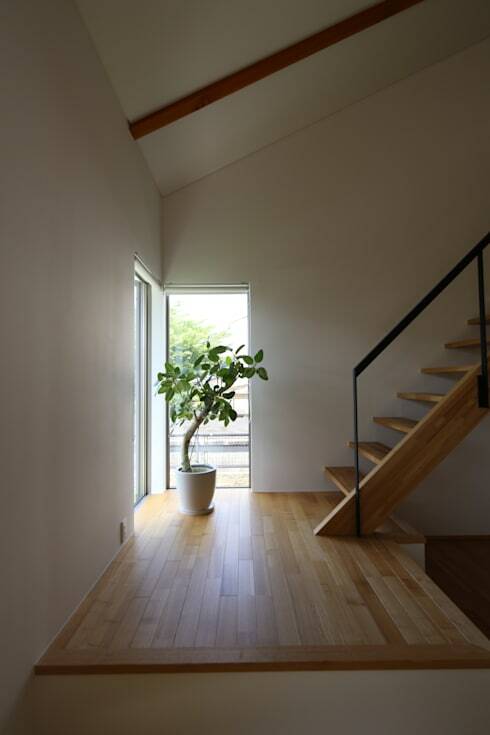 The greenery added to the space by the pot plant brings serenity into the atmosphere, a very Japanese inspired look. It's fresh and simple, but still unique and interesting, especially in this specific placement. While the rest of this modern home has a strong wooden appearance, the all-white bathroom is super sleek and stylish. It's an excellent use of a small space; by choosing to go for a large shows, it feels significantly bigger than it is. 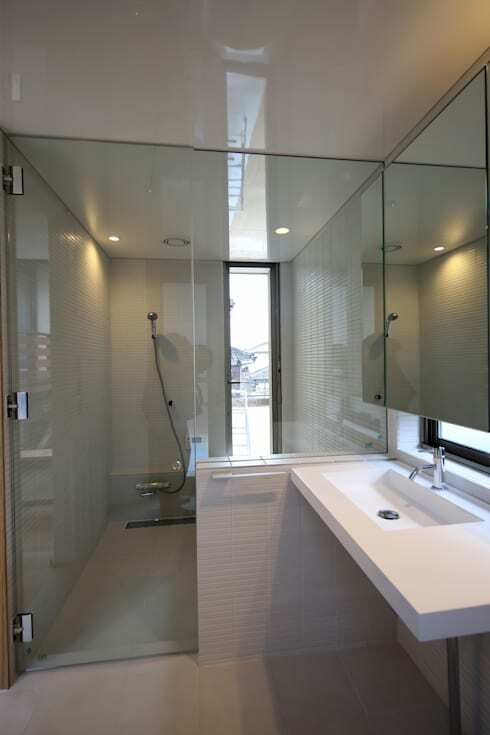 The white walls, glazing and modern fixtures and fittings are an awesome choice to ensure that this bathroom will remain tasteful and trendy for years to come. Of course a large mirror enhances the look of the whole space—a must have feature in any small bathroom. If you liked this lovely home, then A gorgeous but simple Johannesburg home with something for everyone will surely please you too! What did you think about this lovely modern home?